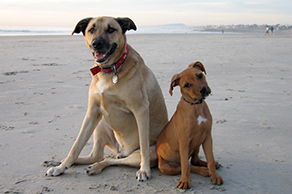 At Santa Barbara Dogs we strive to be the very best at both taking care of dogs and our clients. We are a reliable and responsible company who believe in positive reinforcement training, and effective group management. We work together in a way that’s rare in this industry, and this allows us to provide the consistency and reliability we swear by. We understand dogs and dog behavior, so whether in be on a daily walk or hanging out for the day, our four-legged friends have a fun and safe time where they can learn new tricks and get the undivided attention they love. Whether it's one-on-one or as a part of our dog pack, everyone has fun. We take dogs out for beach walks, mountain hikes or just a long walks around their neighborhood. We know that some pets do better in their own home. So we come to them! We take care of the little things so that you can enjoy your trip and know that your pet is in good hands. We have a profound understanding for dog behavior and relationships and will help set the perfect foundation to continuing building on for many years to come. Every time your dog comes home from time spent with Santa Barbara Dogs, they will be happier and healthier — we gauruntee it! We take dogs to romp, play, and learn around the city — including beaches, hiking trails and neighborhood walks. We return them happy and ready for a low key evening with you. Unlike most dog walking companies, we walk weekdays and weekends and will both pick pets up and drop them off. Every dog is guaranteed a minimum of 60 minutes of play time, and if the day is just right we may stay out even longer. You can choose a private walk or a pack walk where your dog can play with a 3-7 carefully chosen friends. Our pick up time start at 7am and everyone is home by 7pm. Although we have set pack walking times, we try to accommodate requests wherever possible. We love putting together custom packages to suit your lifestyle. Please contact us to learn more about our affordably priced packages.